During the Great Recession and its aftermath, provision of social housing by Local Authorities (LA) and Approved Housing Bodies (AHB) fell sharply. In 2007, the combined provision by LA’s and AHB’s was 8,763. However, this traditional supply of social housing fell dramatically, to less than 760 units in 2013 and 2014. 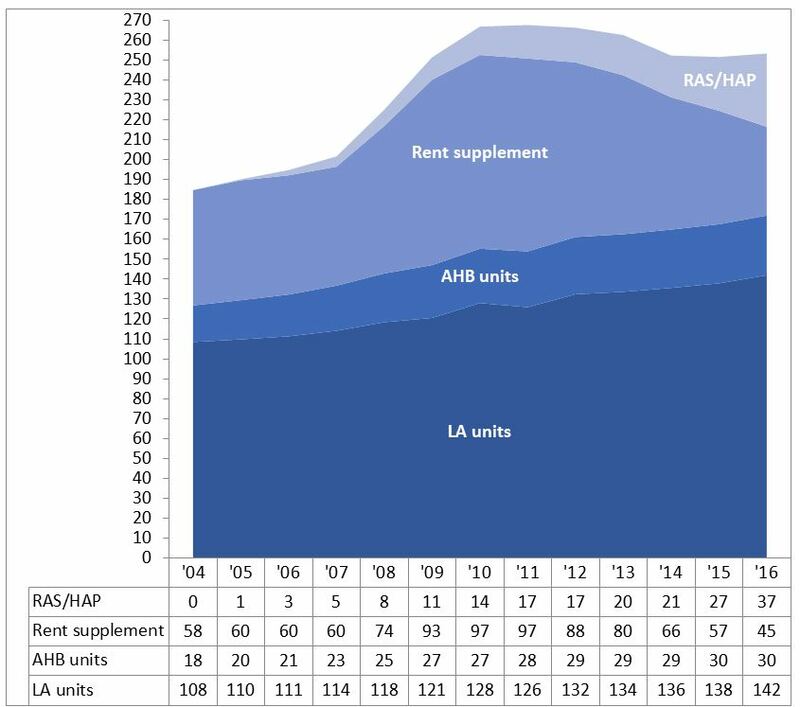 In more recent years social housing provision has increased again, although not to levels seen before the Recession: in 2018 4,115 units were provided by LA’s and another 2,465 by AHB’s. While provision of social housing by the private rental sector has grown substantially in recent years, LA’s still retain a sizable proportion of the social housing stock. Rent Supplement (RS) – provides financial support for renting in the private sector to existing tenants who cannot provide for the cost of their accommodation from their own resources. This payment was first introduced in 1977 and is administered by the Department of Employment Affairs and Social protection. Rental Accommodation Scheme (RAS) – is a social housing support introduced in 2004 to cater for the accommodation needs of persons who are in receipt of long-term rent supplement and assessed as needing social housing. RAS is administered by LAs which source housing from the private rental market and enter a tenancy agreement with a Private landlord and the RAS recipient. Social Housing Current Expenditure Programme (SHCEP) – is a Department of Housing, Planning and Local Government (DHPLG) funded programme that enables LAs and AHBs to acquire dwellings on a long-term lease and let to individuals or families deemed as in housing need or on a waiting list. Housing Assistance Payment (HAP) – was introduced in 2014 on a phased basis to replace long-term RS and RAS. Similar to the RAS scheme, LAs provide housing assistance for households who qualify for social housing support, including many who would previously have been long-term RS recipients. Under the HAP Scheme, the LA pays the rent directly to the landlord and the tenant pays the relevant differential rent to the LA (a rent that is set by a LA based on income and ability to pay). According to the Rebuilding Ireland: an Action Plan for Housing and Homelessness report, a key benefit to be derived from this transition is the provision of a greater mix between private and social housing as opposed to a heavy reliance on large public housing projects investments seen in the 1960’s and 1970’s (Government of Ireland, 2016). Table 1 shows the range of social housing outputs provided over the years 2005 to 2018. Prior to the Great Recession (2005-2007), LAs supplied 5,745 social housing units, with AHBs providing a further 1,425 social housing units on average per year: a combined average of 7,170 units per year. The private rental market (through the RAS) supplied an average of just 1,920 social housing units per year. During the recession and its aftermath, there was a dramatic decline in the output of social housing units provided by LAs and AHBs. In particular, LA council housing provision declined from a peak of approximately 7,000 social housing units in 2007 to 285 units in 2014. Conversely, the share of social housing units provided by the private rental sector grew substantially. The private rental sector combined supplied near to 9,000 social housing units in 2015 through the various private rental schemes (i.e. RAS, HAP and SHCEP) and HAP accounted for the bulk of this expansion in the private sector. More recently there has been a rise in the number of social housing units provided by LAs and AHBs. In 2018, LAs supplied 4,115 social housing units, with AHBs and Part V New Build combined accounting for a further 3,306 units rented to low income families. Notwithstanding this increase in social housing output, the social housing units provided by LAs (LA Completion and Acquisition) remains below pre-recession numbers. Moreover, the private rental market has continued to increase steadily, supplying near to 20,000 social housing units in 2018 (an increase of almost 16,000 units on 2014). These most recent trends suggest that there has been a greater shift towards the private rental market as a model of social housing provision. 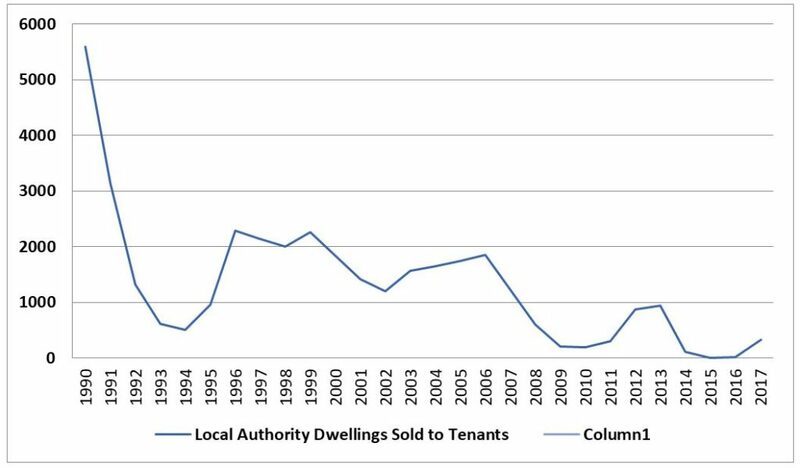 Figure 1 shows trends in the sales of social housing during the years 1990 to 2017. A notable feature in social housing trends has been the rapid decline in tenants purchasing of social housing in recent decades. In 1990, almost 6,000 tenants purchased their homes. Sales averaged just fewer than 1,000 per annum from 1996 to 2006. However sales dropped sharply during the Recession and have not recovered since then. Only 2 council houses were purchased in 2015 and 325 in 2017. Sales of LA units have thus contributed little to the recent privatisation trend. Sources: Norris and Hayden (2018); DHLG (2019c). Figure 2 shows an estimate of the total housing stock under each broad category of scheme during the years 2004 to 2016. In taking a broad view of social housing outside the remit of traditional LA and AHB’s providers, it is evident that an increasing number of low income tenants are having their social housing needs met by the private rental sector. During the Great Recession, the number of RS recipients increased significantly, reaching a peak of 97,000 in 2010 and 2011. While the number of RS recipients decreased to 45,000 in 2016, this has mainly been due to an increased uptake of RAS/HAP schemes by tenants who are eligible to be included on the social housing waiting lists. The number of RAS/HAP recipients increased considerably from approximately 3,000 recipients in 2006 to 37,000 in 2016. Combined the RS and RAS/HAP accounted for total of 82,000 housing units in 2016. Notwithstanding the rise in social housing outputs provided by the private rental sector under the RS and RAS/HAP rental schemes, the traditional LA housing sector still accounts for the majority of the total social housing stock. In 2016, LAs rented 142,000 social housing units, an increase of 31,000 units on 2006. This is in spite of the decrease in the output of social housing during the recessionary period and consistent public policy transition in recent decades from a focus on direct provision (by mainly LAs) towards private sector mechanisms of social housing provision. While the stock of social housing units increased from just over 200,000 in 2007 to over 250,000 in 2016, the public sector has maintained its two-thirds share of the total stock. The increased reliance on the private sector for social housing in 2017 and 2018, evident in Table 1 above, would have shifted that balance somewhat more towards the private sector. Source: Corrigan, E. and Watson, D. (2018). Approved Housing Bodies (also called housing associations or voluntary housing associations) are independent, not-for-profit organisations. They provide affordable rented housing for people who cannot afford to pay private sector rents or buy their own homes; or for particular groups, such as older people or homeless people. ) (DHLG, 2019a). Leases can last from 10 to 20 years for LAs or 10 to 30 years for AHBs in duration. Social Housing Data in between the years 2015 and 2018 includes the Voids figure of 7,446 (i.e. local authority units brought back into use through regeneration and local authority construction activity). Part V refers to the provisions relating to Housing Supply in the Planning and Development Act 2000-2017. These figures include Part V units delivered under LA Construction, AHBs and SCHEP. All Part V output is included under this heading from 2017 onwards only (DHLG, 2019b).